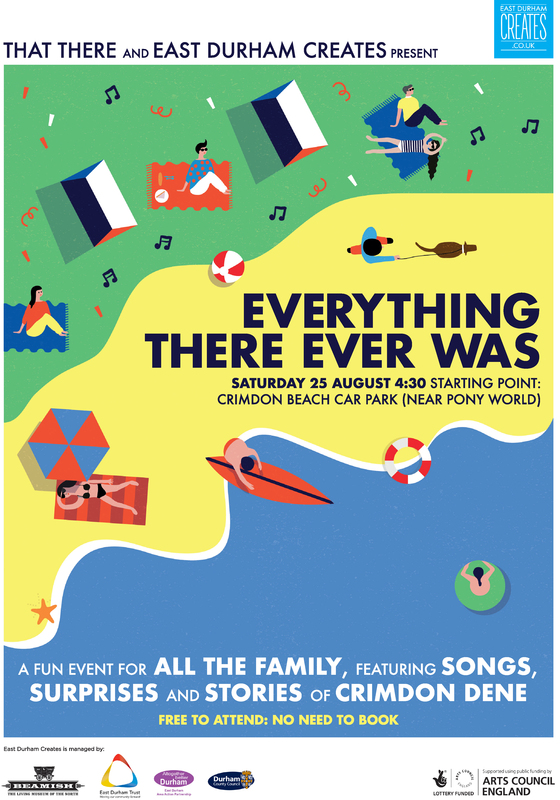 Everything There Ever Was is a large – scale participatory performance in Crimdon Dene, featuring choirs, a live band, performances and evocative stories of the area’s past. The stories have been collated from local people from East Durham, and through collaboration with That There have created the music, performance and even designed the set props. They will also be the performers and singers on the day, an event to truly celebrate the people from this area. It’ll funny, fun, moving and magical. There will also be a picnic, which will be distributed as part of the performance. It will be a great event for all the family! The show tells the story of a family who are about to move away from the area. Will they miss it? They’re not sure it really makes any difference where you live, or where you’re from, these days. But an encounter with the magical Watchers by the Sea leads them to the pageant of Everything There Ever Was – and their relationship with this place they call home will never be the same again. Everything There Ever Was will recreate many of the things that have happened here through time, the things that give this place huge value to the people who have lived here and moved through here. Farmers, miners, holiday makers – even dog walkers and bird watchers.